PPARα activation stimulates FA and triglyceride metabolism. 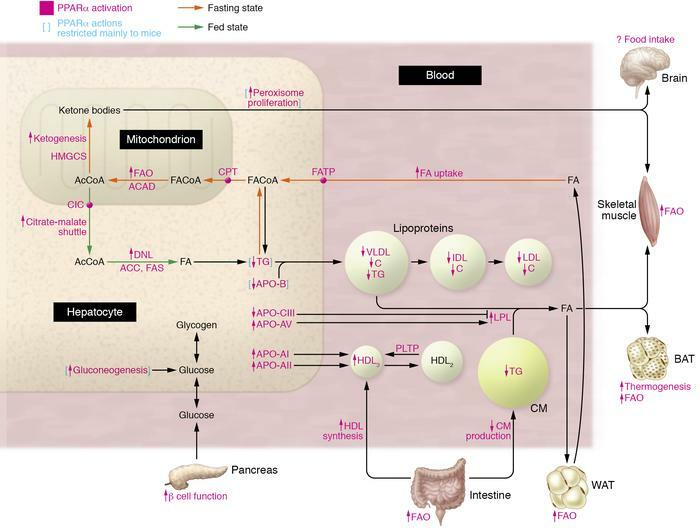 During fasting (yellow), FAs released from WAT are taken up by the liver and transported to mitochondria, where FAO takes place, to produce acetyl-CoA (AcCoA), which can be further converted to ketone bodies and serve as fuel for peripheral tissues. In the fed state (green), acetyl-CoA is shuttled to the cytosol, where DNL takes place. The effects of PPARα activation and PPARα target genes are indicated in pink. FAO is also stimulated by PPARα in WAT and SKM. By regulating hepatic apolipoprotein synthesis, PPARα activation decreases plasma levels of triglycerides (TG) and LDL-C and increases HDL-C. PPARα also acts on BAT, gut, and pancreas, but its central effects are unclear. Blue brackets indicate PPARα actions that are mainly restricted to mice and do not occur (e.g., peroxisome proliferation, reduced liver fat content) or occur to a lesser extent (e.g., reduced APO-B production) in humans. ACAD, acyl-CoA dehydrogenase; ACC, acetyl-CoA carboxylase; CM, chylomicron; CPT, carnitine palmitoyltransferase; FACoA, fatty acyl-CoA; FAS, fatty acid synthase; FATP, fatty acid transport protein.